In my house there is always time for tea and if you don’t see me with a cup, you know something is wrong! What I’m trying to say is that I love tea and will drink it until it comes out my ears. So, as a nice little gift Tom bought me Mr Tea! Mr Tea is the perfect companion for your afternoon tea. Just load his little silicone pants, perch him in your cup, watch him relax, and your orange pekoe will be perfect. Ahhh, so relaxing. Mr Tea is an infuser for leaf tea and he sits in your cup looking all happy and content. You place your leaf tea into his trousers and put him back together by his waist. He looks so happy in my hands! Mr Tea is definitely a positive product for me and I love his happy face! I used Earl Grey in his pants (doesn’t that sound weird?) and it was surprisingly really nice. I didn’t leave him in long enough so it was a little weak, but that was my fault. One negative for me is how you put the tea inside the little man’s trousers. I spoon fed the tea into the legs, but it was awfully messy and I found bits of tea everywhere! Yes, you’ve read that correctly I’m typing up a tea review. Are you all excited? In March I moved from my home town and parental home to Wrexham where I now live with my boyfriend, Tom. To say I miss home is an understatement, but it is nice living with someone you get on with. (even if he isn’t my Mum). I had to do a little exploring because I didn’t know Wrexham very well and I wanted to find some of my favourite things, coffee shops, book shops, the local library, etc. Well, on my adventure I found ‘Just Tea and Coffee’ a really nice independent shop that sells leaf tea and ground coffee – no tea bags in sight. I’m a lover of all things tea (as you know) so I was in heaven. As a little treat to myself, I purchased the Wrexham Tea and Lady Rose Tea. Wrexham Tea – The handsome tea blend has a smooth and rich character, it’s powerful in flavour, a little malty with a warm golden liqueur. Perfect drinking tea. I absolutely love this blend. If smell-a-vision was invented i’d make you all have a good sniff. You can smell the golden liqueur straight away and it reminds me of sweets. It’s close to a normal cup of tea so you can add milk and sugar. I seem to have replaced the traditional PG Tips with this for my morning brew. Lady Rose Tea – This tea is deliciously centered with bergamot oil, natural flavouring oil of fresh roses, dried rose blossoms are added making this a beautiful cup of tea. I wasn’t a lover of fruit teas but since a work colleague got me onto drinking Raspberry, I thought I’d give Lady Rose a try. It’s a very floral cup of tea, what with it being flavoured by dried roses, so you know the taste is going to be a little different. For me, it’s just enough, even if I have to add a sprinkle of sugar. As you all know I love two things in life and they are tea and books. I haven’t really posted many tea related posts on the blog so I thought I would write one. It should show you a little insight into what I like and how I drink my tea. Do you have a favourite mug to drink tea from? Yes, I do. 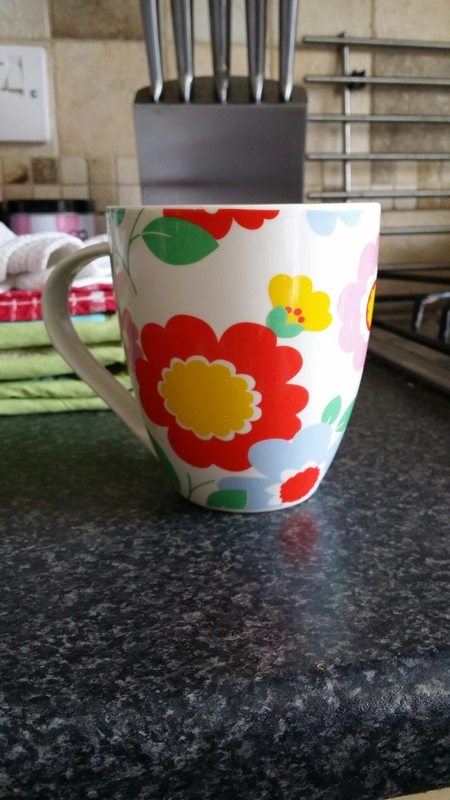 It’s a large mug from Cath Kidston; It was a birthday gift. Milk and two sugars, please. I probably shouldn’t have as much sugar but hey, it’s my only vice. (Besides Rum hehe). Do you do herbal tea or is it just traditional? 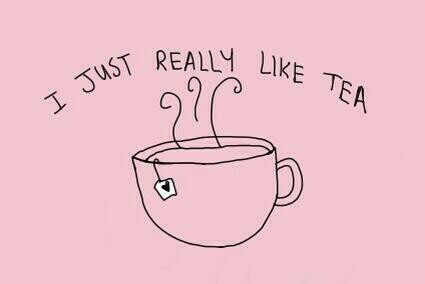 I’m all for spicing things up a little so I love flavoured teas such as Earl Grey, Lady Grey and sometimes Green tea. Why do you like tea so much? I really don’t know. I just tried a cup when I was younger and bam, I loved it. I think I got hooked onto it when I was in university, even though I’m sure people think it would be alcohol. Have you ever tried coffee? Yes and I physically cannot stomach it. If I accidentally taste it I gag. A fancy package arrived on my doorstep this morning and of course, I was very excited. What’s inside I hear you say? Well, just take a look below! It’s some Tea! 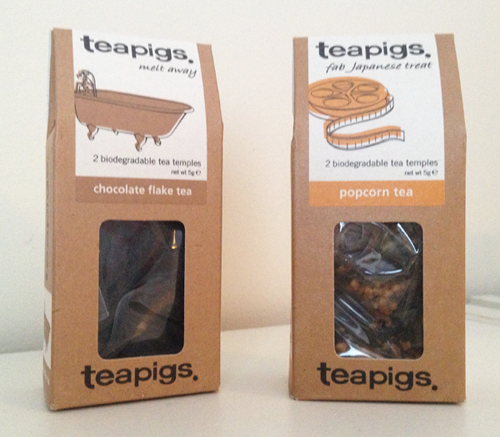 I ordered some amazing sample packs of Popcorn, Chocolate Flakes and Matcha from the guys and girls over at Teapigs. They even sent me an Earl Grey sample, which I’m currently enjoying as I sit and type this post! For those of you that don’t know, Teapigs is a great and ethical Tea company that believe in providing high quality products that not only taste amazing, but make you feel good, too. Oh and did I mention that they love drinking tea? You can find out more at www.teapigs.co.uk or follow them on Twitter at @teapigs. Go on, show them some love. Just look how cute the little boxes of Tea are? I’m definitely going to keep them and find a place to show them off. What’s your favourite flavour of Tea?